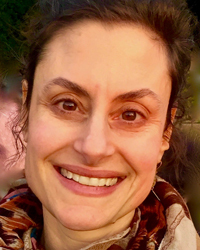 Marisa Handler has practiced Insight Meditation in retreats and daily life for 16 years, and is a writer, singer-songwriter, teacher, and coach. She has taught writing as a tool for healing chronic physical and mental illness, and for deepening our experience of awakening, and has published her writing on her own journey through the dark night. She is the author of the memoir, Loyal to the Sky, which won a Nautilus Gold Award for world-changing books, and her essays, fiction, and poetry have appeared in numerous publications. She teaches Creative Writing at Mills College and Stanford University and workshops at Esalen and CIIS. She is also a committed practitioner of Byron Katie’s The Work, Authentic Movement, and Biodanza. More at www.marisahandler.com.